Gregory Alan Williams In Search of Heroes interview was amazing. Gregory Alan Williams Baywatch TV Star was interviewed by high school journalism student Dan Mader. It is truly amazing and worth watching. As a proud Marine veteran, Mr. Williams described the solutions to the social problems in the USA. This is one of the best explanations of heroism. “There is a little bit of good in the worst of us and a little bit of bad in the best of us. We all have the potential to be heroes to another person when we help them without expectation of return.” —Gregory Alan Williams, Baywatch Star, Marine Veteran and first Hero to be video taped in 1992 for the In Search of Heroes Program. Dan Mader: Gregory Alan Williams is perhaps best known for his role on the TV show Baywatch. He played Sergeant Garner Ellerbee. He’s also a Shakespearian trained actor and served in the Marine Corps. He’s also a real-life hero, having saved the life of a man in the LA Riots. And, he has recently written his memoirs titled “A Gathering of Heroes.” Mr. Williams, I’d like to present you, on behalf of the In Search of Heroes Program, with the picture of the previously interviewed cast of Baywatch, David Charvet and Nicole Eggert. Dan Mader: And here are the certificates and hero cards to go with them. Gregory Alan Williams: Thank you very much. Dan Mader: The first question I’d like to ask you, in keeping in the vein of heroism, I know as we’ve interviewed different people through the course of this program, what comes up often is that the real heroes are parents, and especially single parents. I know that you were raised by a single mother. Can you give me your thoughts on parents as heroes? Gregory Alan Williams: Well, I think that heroism can often be defined as a commitment to others long term; long, steady and constant. And, I think parenting requires that kind of heroism. Gregory Alan Williams: We often think of heroes as being extraordinary people, people who accomplish great feats. But, when you consider paying the rent or the mortgage on a regular basis, keeping groceries in the refrigerator, keeping the utilities on, the gas and the lights and so on and so forth; putting bandages on wounds, putting love and kind words on hurts of the heart, those are ongoing commitments and I think that that is heroism. And, I think if we look at our parents, we will find heroism very, very close to home. Dan Mader: Can you tell me a little bit about the events in the LA Riots, tell me what happened? Gregory Alan Williams: Well, I was in the intersection of Florence and Normandy in hopes of being a voice of reason with those few individuals there, who were committing acts of violence against strangers, but strangers who were human beings and fellow Americans. Gregory Alan Williams: When I arrived, a brown Ford Bronco pulled into the intersection and debris struck the vehicle from almost every corner. The driver stops, people ran out to the vehicle and began beating the driver inside. Gregory Alan Williams: The driver turned out to be a Japanese-American named Tatao Hurata. I was standing on the southwest corner. As he slumped forward unconscious, I moved into the crowd and was able to get him out of the truck. As I pulled him from the truck, I was joined by a Mexican-American law student named Jorge Gonzalez, who moved to intervene on our behalf, to help us out. Gregory Alan Williams: And, he was struck and knocked to the ground and kicked and beaten. His assault, I should say, his intervention, served as a diversion and I believe the folks that struck him were about to strike myself and Mr. Hurata again. Gregory Alan Williams: So, I was able to get Mr. Hurata down the street where other neighbors in the neighborhood intervened and summoned a passing police cruiser and brought a paper towel to wipe his wounds and asked me to set him down on their grass. Gregory Alan Williams: And, folks came along and asked if they could take him to the hospital. Finally, he was taken to the hospital by an African-American man in a van. At that point, he was bleeding from, I believe it was his left ear. That single entity was hurt very badly and had it not been for that man that took him to the hospital, Mr. Hurata may well have died. Dan Mader: Saving that man’s life, I’m sure everyone agrees, is certainly a heroic act and makes you a hero. But, when we talked earlier, you said a few things that I thought were very interesting. You said that was your responsibility to act like that. And you also said that it was a selfish thing. Gregory Alan Williams: No question. We ask that proverbial question, “Am I my brother’s keeper?” “What is my responsibility to another human being?” Dr. King told us that we are tied in a single garment of destiny and whatever affects one directly affects one indirectly. Mr. Hemingway, quoted another writer saying, “And, never sent to know for whom the bell tolls. It tolls for thee.” So,me folks talk about karma. Other folks say, “What goes around, comes around.” So,me folks say, “You reap what you sow.” In every culture, there is some sort of saying that suggests that you get back what you put out. If that is so, then it is in my best interests to look out for my neighbor. As Americans, we have throughout our lives, taken a pledge to preserve liberty and justice for all. The day Mr. Hurata was beaten, his liberty was stolen…liberty in this instance defined as security of person, the right to go to and from one place to another unmolested, unafraid, and so on. It is then as an American, I’ve taken the pledge, made the oath, that I would preserve liberty and justice for all. It is then my responsibility as an American to do that when I can and wherever I can. The promise of Democracy is fulfilled person to person. The principles of the Constitution are honored person to person. And, so is the Bill of Rights. If I wish to demand justice, then I must be willing to preserve justice. Dan Mader: So, does it all come back to the Golden Rule? Gregory Alan Williams: Yes, and that’s why it’s golden, because it is universal. “Do unto others as you would have them.” Certainly, were I in a vehicle at an intersection being beaten, I would have others do unto me as I did unto Mr. Hurata. I would have someone, if it was in my power to mesmerize anyone, to come rescue me. I would want, need, and require that. So, then, with Mr. Hurata, I did unto him what I would have others do unto me. Dan Mader: Isn’t that just one of the greatest parts of human nature, though, that we are willing to help? Gregory Alan Williams: It is one of the parts of our nature. Our natures are varied. We are as capable of great acts of compassion as we are horrible acts of intolerance and of course indifference. So, our natures are varied and that is one of the things that I have to come to accept. There is a bit of bad in the best of us, and a little good in the worst of us. I must be on guard for those aspects of my nature that are not compassionate. I must be on guard for my racist nature which is brought about by my fearful nature…afraid that I’m not going to get something I want or I’m going to lose something I’ve got. Our lives generally speaking are shot through with fear. We don’t see it as fear because it manifests itself as anger, righteous indignation. And, we don’t acknowledge that it’s really fear based. I’m afraid of these people, of this person, because they might take something away from me or they might prevent me from getting something that I need or my children might not be getting something they need, and that sort of thing. So, we have to be on guard for those ugly things in our nature, and be willing to accept them and embrace them as being a part of our nature. Dan Mader: When you saw the man being attacked, it would have been easy, probably the easiest thing to do was just walk on by. And, earlier we talked about possibly what makes a hero is that the great people we talked about…Martin Luther King, Malcolm X…they have the strength to overcome the desire to conform and stand up for what they believe in. Gregory Alan Williams: Jefferson, Franklin, Madison, Hale, great men all. Likewise, Robert E. Lee. All these men, men who made choices, difficult choices. It certainly would have been easier to acquiesce to the rule, the king’s rule, for learned men of property as Mr. Jefferson was a learned man of property. It would have been easier. He could have gotten his perks and even become a wealthier man. But, he went against the grain. He chose liberty. Malcolm X also chose liberty. His father was murdered by a mob. His mother died of – of grief induced – or madness induced by grief. She lost her mind. He too opted for liberty. Martin Luther King opted for liberty. Robert E. Lee opted for what he felt was liberty, you see. The right to choose, to make choices. All of these men, great American patriots. Being a patriot is not necessarily going along with what the government thinks is right. Going along – going for what one thinks is best for the people. There’s also a thing – an issue of honor. I am an ex-Marine, and you know, I was taught that honor was being willing to die and often dying…that that was the ultimate sacrifice. The ultimate sacrifice was not how you lived, but how you died. I am not exactly sure how I feel about that. But, if I consider myself an honorable man, then how in the name of Heaven can I stand in the face of another man who’s being deprived of his liberty and call myself an honorable man? Which is another reason why the act was selfish. I could not! How could I look my son in the eye or talk to anyone about honor, having stood in the face of a man being beaten to death and not made a move? How could I call myself a man? Now, I could lie to you and I could lie to me, but, I’m not comfortable with that, with lying to myself. So, I moved forward to preserve my honor. And, you know, I know that in this day and time, honor is not a politically correct kind of term or attitude. But, one thing I’ve learned about living is that you take what is good from your experiences…what you can use, and leave what you can’t. Rarely should we write an experience off wholesale. There is much good that we can take from even things that may be a bit unpleasant. And, one of the things that I took from the Marine Corps was the concept of duty and the concept of honor and faithfulness. Dan Mader: You talk about Jefferson. You talked about all the great Americans, and is it fair to say that this is really a country founded by heroes? I mean, the American dream is the dream – to desire for freedom – you have the right to freedom. No one can deny you your freedom. And, these heroic men set all this up so people today can live with that. And, so you knew that you had to step in. Gregory Alan Williams: They set it up, but they were shortsighted. Mr. Jefferson himself demanded liberty for himself, but was unwilling to preserve liberty for the black folks who he owned. There’s a bit of bad in the best of us, and a bit of good in the worst of us. And, the humanity in all of us…shortsightedness, misunderstanding, a failure to see the forest for the trees. Here, on one hand, Mr. Jefferson demands justice for himself and is unwilling to preserve justice for other human beings. Now one can say, well, he really – he really didn’t make a mistake because he didn’t consider black people to be his equal. He considered them to be beasts. Well, if that’s the case, why did Mr. Jefferson then have so many black children? Why did he sleep with one of his black slaves, if she was a beast…an animal? Well, I’m not going to condemn Mr. Jefferson. I’m as flawed as he is. I suffer from the same kind of shortsightedness. But, because one has flaws, because one fails, does that make one less heroic? It perhaps makes them more heroic because we see in the face of their failings, in the face of their shortcomings, they still were able, at moments, to rise to pinnacles of greatness. Dan Mader: If we look for perfect heroes, we will always be disillusioned, won’t we? There will be no heroes! If perfection is a requisite for heroism, there are no, there will be, there are no heroes. It is often, however, a person’s flaws that inspire. As I mentioned, if a person, if a man or a woman can achieve great things and by great we mean… remember that consistent, steadfast kind of commitment to purpose and to our own lives and to the lives of others. If we can maintain that, even in the face of our fear and our anger and our shortsightedness, then we are, we are truly heroes. Dan Mader: Do you think of yourself as a hero? Gregory Alan Williams: No. Yesterday’s scores will not win today’s ballgames. If the Padres go out and win on Tuesday and they’ve got a game on Thursday, and when they hit the field, they say, “Well, you know what, folks, we won Tuesday so…” The fans will say, but today is Thursday, you see. So, my actions in the intersection of Florence and Normandy are, will not hold me today in the face of a indifferent injustice, of a new injustice, in the face of a new victim, new perpetrators and new mobs and new bystanders, you see. Heroism is a commitment. It’s steadfast. It’s ongoing. Perhaps, all that’s required to rush into the midst of a mob is a rush of adrenaline. I have a firefighter friend named Newman. I asked Newman one time what requires greater – which requires greater courage, rushing into a burning building or taking care of your family one day at a time. He said, oh, most certainly taking care of my family. And he was the one who said rushing into a burning building requires some degree of skill. Primarily, it’s about a rush of adrenaline. But, the compassion that is required as a husband, a wife, a father, friend, teacher, disciplinarian, that, my friend, is where the struggle is. We may want to go bowling, you know, but they, it’s, it’s bazaar night at the kid’s grade school, you know. This is your big bowling night. What do I do? Do I go and be with this child who will probably not remember this, you know, or do I go bowling? That is where our heroism comes in, our willingness to commit. Dan Mader: So, we need to be able to see the difference between true heroism and heroic acts? Gregory Alan Williams: There is heroism in, certainly, heroic acts. I guess what I’m saying is, is that we, we can find heroism in other than extraordinary acts. Or, because I think that the daily commitment and fulfillment of a commitment is extraordinary. As I became an adult and realized what was required to be an honorable adult, I realized. And oh, goodness gracious, I tried to avoid it. I mean, I tried all kinds of ways, because I thought, oh, my goodness, this adult thing, this responsible thing, this is, you know…let me hang out and go party, you know. But there’s definitely heroism. We need to look in other places because as long as we say that heroism is an extraordinary act of courage or bravery at great risk to one’s self, to one’s physical self, for example, then I can deny my responsibility to other people because I can say, oh, well, that guy was very strong. He was very brave. He was very courageous, and I’m not very brave, and I’m not very strong. So, I can never do what he did. I could never be a hero. And, so that allows people then to disassociate themselves from their responsibility to other people. If they come to believe that that responsibility requires great bravery, great courage, great strength, you see, then they can say, oh, they can distance themselves and say, “Well, no, I don’t have to raise my voice in the face of mob violence because that man who did was strong and tall.” You see, so I don’t have to do that. But, the truth is, that we all must raise our voices in the face of a mob. Dan Mader: I believe that no matter what the age of a person, I mean, people say that teenagers lose their respect for heroes, adults lose their respect for heroes, but I think that we’re always searching for heroes, someone to pattern our life after. So, who do you feel would be the best hero today? 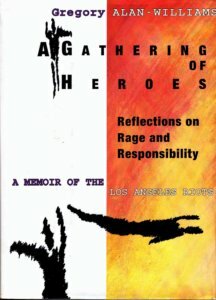 Gregory Alan Williams’ book, “A Gathering of Heroes: Reflections on Rage and Responsibility” provides solutions to the current race relations warfare. A Gathering of Heroes written by Gregory Alan Williams. Gregory Alan Williams: I call my book A Gathering of Heroes because I think that’s what we require – a gathering of heroes. And those folks come in all different forms. So,metimes they enter our lives for only a brief moment, passionate moment. A word, a phrase. There’s nothing to fear but fear itself. I wonder how many soldiers in the Second World War remember Mr. Roosevelt’s words in battle, “There’s nothing to fear but fear itself when you are scared to death.” So, for some, see, that’s a moment, you know, someone we can – oh, that’s a hero. I’ll take that. Here’s a man who, once vital and healthy, finds himself in a wheelchair, but he kept pushing or perhaps that was inspirational to people and he saw Mr. Roosevelt as being his hero in his life. There is a gathering of heroes in our lives… all kinds of different folks, I think, who come in. I think it’s best for us to be pragmatic. If we say I want to pattern my life after this person, the moment we see imperfection, then what happens to the pattern, you see. My mother sews and I remember when I was little, we used to go to J.C. Penney’s, she used to get a pattern. And, she would make that dress based on that pattern. If the pattern was messed up, the dress would be messed up. I guarantee you, that any human being that you pattern your life after will be imperfect, therefore, the pattern will be messed up. So, what one wants to do, perhaps, is to take from a variety of experiences, situations, and people, and create their own pattern for your own life, you see. Take a little from Bob, a little from Bill, from Ellen, little bit from Susie, little bit from Confucius, little bit from Roosevelt, little bit from Kennedy, little bit from Cain, little bit from Malcolm, you see. What we’re so used to doing is throwing out the baby with the bathwater. Oh, he’s a republican…write him off. He’s a democrat…write him off. He’s white…write him off. And, there may be all sorts of good things coming out of this person which we can learn, but if they aren’t a member of our group, if we aren’t affiliated with their sect, if we don’t speak their dialect of English, then, oh, write them off. And we lose. You have two men. And one has a parcel of land and the other has seed. Well, the man with the parcel of land says, “Well, you know what, you don’t speak my dialect of English so I’m not going to let you plant your seeds on my land.” So, the man with the seeds says, “Oh, yeah, well, no big deal. You don’t speak my dialect of English, you know what I mean, so I’m not going to plant my seeds in your land.” And come spring, they find them both dead of starvation. See what I’m saying? One’s got the land and the other’s got the seed. But, they got these things going on with each other which keeps them from coming together cooperatively and sharing the value that they both have. One has valuable seed, the other has the land, and one without the other is worthless, you see. They both die. They both starve to death. And, so very often in our lives, this is what happens. We starve spiritually, psychologically, emotionally, physically, because we’re unwilling to exchange with people what we need because we are not a part of their group, you see. It’s a dangerous way to live, so I suggest that we be pragmatic. And if we see a person with some seed, and I know I’ve got a little land, even if I don’t have some land, I’d say, “Hey, listen, you’ve got some seeds there. Could I get a couple of those, you know?” And maybe I can, you know, and I could start my own garden. So, I think patterning our lives after a specific person may be a mistake. I think we may be doomed for disappointment. But, if we recognize that people are imperfect and we go about gathering what we can from people, from a gathering of heroes, we may be a lot better off. Dan Mader: Does it all start with tolerance, then? Gregory Alan Williams: I think that’s a major part. I think it starts with tolerance of ourselves. You know there are days when I’m intolerant. There are days when I pull into a gas station in California, I’m looking for directions, and it seems the people in the gas station don’t know where they are let alone where I need to get to. See, I grew up in a place where you could always count on directions at a service station. At a filling station, you could get your car fixed. You could get water. You could get air. For me, a service station was a landmark and it was a place where the people who worked there knew their community. We’re a nation of immigrants, voluntary or involuntary. That’s what we are. There was a time when my descendants didn’t know where they were. Didn’t want to be where they were. So, I have to be tolerant of myself knowing that I’m going, I’m not going to beat myself up, beat myself over the head with a baseball bat. So, and indifference is the other, I think, great scourge. I mean, Elie Wiesel. says that, the great Nobel laureate, writer, Holocaust survivor says that, “The opposite of love is not hate, it is indifference.” But, indifference is more dangerous than hatred. And, that is the other thing I have to be on guard for, indifference. Well, it’s not me being beaten, it’s not my family…couple of guys on my soccer team. Hey, it’s not my business. That is what is dangerous, indifference. So, intolerance and indifference. Dan Mader: Right now, you hear the naysayers, the media – I hate to bring the media up – but specifically the media projects a negative image. The teenagers of America are apathetic. They don’t care about anything. They don’t hold any values dear. What do you feel about that? Gregory Alan Williams: I think to a large degree; the news is the news. Used to be the news was what was happening, but now the news is the news. You must understand that the media is a profit-based, a profit-based organization. They’re in business to make money. It is perhaps easier to make money feeding people images that they will more readily accept than it is to feed them images that require them to think or wrestle with. It is perhaps easier to go along with the popular mindset than change minds. Certainly if I wish a greater constituency, a greater demographic, a bigger audience, what will I do? Show that audience things, images that they are not familiar with, or show them images that they’re already comfortable with so they can tune in to my station, they can tune to my station and say, “Oh, this is my station because I’m comfortable with the images.” No one likes change. So, it’s easier to make money by showing images that people are familiar with. I think there’s one thing we need to understand. The youth of America, oh the youth of America is no different than it’s ever been. The youth of America is always, it is, it is natural for youth to be at odds with age and for age to be at odds with youth. That is the nature of things. Each generation says, “Oh, those kids today. Wasn’t like when we grew up.” I don’t know how it is that we come of age and seem to forget we were 16 and 12 and – it’s a weird thing, you know. It’s a very strange thing. I don’t, I think youth today are facing challenges. We all face new challenges. Genocide and madness can can be disseminated much more quickly through the information superhighway. The speed with which information is transmitted from one person to another and the modes of transmission, means we are all at risk. I think that’s our current danger. Dan Mader: Okay. Mr. Williams, thank you very much for meeting with us. Gregory Alan Williams: Thank you. Dan interviews other local heroes.